The FBI released more than 2,000 pages that show Sen. Ted Kennedy was the subject of seemingly endless threats throughout his political career. 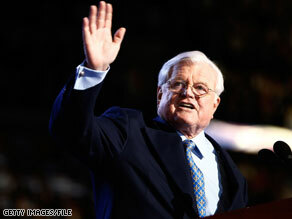 WASHINGTON (CNN) - He buried two older brothers killed by assassins' bullets, and FBI files released Monday showed that Sen. Edward Kennedy was the subject of seemingly endless threats throughout his political career. The more than 2,000 pages made public included threats that ranged from the obscene ramblings of troubled people to angry warnings of death and violence against Kennedy, who was a U.S. senator from Massachusetts from 1963 until his death in 2009. Many of the documents, including poor-quality mimeographs of news articles and official government memos, have handwritten notations on them, presumably by FBI officials who looked them over. A particular focus of the threats, profane messages, defaced photos and other items was the 1969 auto accident in which a car driven by Kennedy ran off a bridge on Chappaquiddick Island - part of Martha's Vineyard - resulting in the drowning death of the lone passenger, Mary Jo Kopechne. "Body guards don't mean thing jack had them but the bullet got him." In response, the FBI monitored the constant tips, warnings, conspiracy theories and allegations of a coverup they received, with former Director J. Edgar Hoover sometimes personally involved, the files show. In a letter to a woman in Collingswood, New Jersey, on July 28, 1969, Hoover thanked her for writing him with her "concerns" about the Chappaquiddick accident and then added: "There is no indication that the death of Miss Mary Jo Kopechne involved the violation of any federal law within the jurisdiction of the FBI." In a June 12, 1968, entry, shortly after the assassination of Robert Kennedy, Hoover called for Edward Kennedy to get "all the protection he needs," adding: "We are down to one Kennedy." In another section, a 1964 memo from Hoover to Kennedy revealed that Kennedy's father, influential financier and diplomat Joseph Kennedy, once offered Hoover significant backing for a possible presidential election bid in 1955. Hoover wrote that he told the elder Kennedy he had no political ambitions and could best serve the country in his position with the FBI. The FBI files covered 1961 to 1986, from just before Kennedy's election to fill the Senate seat vacated when John F. Kennedy became president to several years after his own presidential aspirations ended, when he lost the 1980 Democratic nomination to President Jimmy Carter. While Kennedy was no longer a serious candidate for president, the threats continued. An entry dated May 23, 1985, detailed a profanity-laced threat against Kennedy and then President Ronald Reagan. "Brass tacks, I'm gonna kill Kennedy and Reagan and I really, really mean it," read the threat, according to the FBI file. A footnote at the bottom of the file page said: "Due to nature of the threats, consider subject armed and dangerous." In a later entry, a psycholinguistics report concluded that "the author is merely ventilating her frustrations and projecting her inadequacies. Her intention is to shock in order to gain attention." "Although the subject's ideation is clearly paranoid, the message lacks the indicators of the resolve or the determination to carry out her threats," said the report. Charges in the case were dropped in 1986, according to the file. Threats also extended to other members of the Kennedy family, one of the nation's most influential political dynasties. In a 1974 letter to then FBI Director Clarence Kelley, Kennedy expressed gratitude for "the unusual attention and service performed by the members of your Bureau in the recent possible threat against our children." "The Bureau's advice and guidance was of great comfort to all of us, particularly to my sister-in-law Ethel," Kennedy wrote in reference to Ethel Kennedy, the widow of his brother Robert. In 1976, Kelley wrote Kennedy a glowing note after arranging for the senator and his two sons to tour the FBI. "I don't know that I have seen two better behaved young men than your two sons," Kelley wrote, congratulating Kennedy for "obviously showering them with love and attention." "They reflected that very visibly in their treatment given you," Kelley wrote. "They most definitely adore you. No father could ask for more." More reflective of the files was a 1975 letter received by former Vice President and Sen. Hubert H. Humphrey that noted Humphrey was boosting Kennedy as a possible presidential nominee. "Don't you know that there are millions of us that don't like the (expletive) Kennedys, noteably the women, they still remember how he swam off to save his dirty hide and left Mary Jo to drown in his car," the letter said. "That showed what kind of S.O.B. he is. He should live in the cemetery with John and Robert. So let him run for President if he dares and some one will knock him off just like they did his brothers." - CNN's William Mears, Pam Benson, Jim Barnett, Terry Frieden, David DeSola, Jeanne Meserve, Rachel Streitfeld, Carol Cratty and TomCohen contributed to this report. Whether you liked him or not, no one should have had to live under a constant threat like that! This man, together with his brothers, served this country honorably for decades, and now we get an idea how brave he was to keep at it. He had plenty of money and could've easily walked away from public life and lived quite comfortably. Can't think of too many conservatives with that kind of fortitude. Yes, he was a constant threat to the United States of America. Come on! Are you saying NO DEM voted for the war AND the funding of it? Lte me remind you of a few: Clinton, Edwards, Kerry ! I guess the DEMS share the blame! After all, no funds, no war! @Randolph Carter, I'm no expert but – Nice try but don't think so! Of course he was under constant threat, but he refused to let it stop him do remarkable and historic legislative work and pass some of the most important social legislation for our People. Ted was a man of the People who worked his heart out for the People. I wish he could have lived to his see dream of heatlhcare for ALL Americans pass. Here's to you Ted – a true and noble statesman! Why don't we leave well enough alone. The man, whatever his faults or failures, served this country with distinction and honor. Yes, he was a target (as were all of the members of his family) and remained that way even until his final days. Yes, these files are historical in nature. But for all the commentors here hurling angst and vitrol, you need to focus it on something else. The senator is dead. The country has mourned. We've vented our feelings. Move on. Understand the history, express your opinion civily, move on. A great man, under constant tthreat by the looney right! The ones that a bible thumping gun totin, LOONS! He was and IS a great leader! Miss him every day! Who cares? The world didn't end when he passed away.